Um cometa descoberto recentemente fará um sobrevoo desconfortavelmente perto demais sobre um planeta no próximo ano, mas desta vez não é a Terra que está na mira cósmica. De acordo com os modelos de previsão preliminares orbitais, o cometa C/2013 A1 irá passar raspando o planeta Marte em 19 de outubro de 2014. O intruso gelado que vem da Nuvem de Oort, uma hipotética região que cerca o sistema solar contendo incontáveis ​​bilhões de núcleos de cometas que foram marginalizados do sistema solar nos primordiais bilhões de anos atrás. Nós sabemos que os planetas foram atingidos por cometas antes do enorme cometa Shoemaker-Levy 9, que caiu em Júpiter em 1994 e Marte, em particular foi atingido por cometas no passado. Acredita-se que os oceanos da Terra foram criados, em parte, por água trazida por cometas e os impactos de cometas são uma parte inevitável da vida nesse ecossistema cósmico. 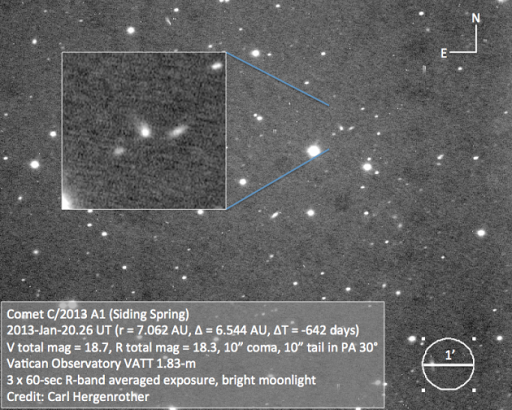 C/2013 A1 foi descoberto por Robert McNaught ace, caçador de cometa no Observatório Siding Spring, em Nova Gales do Sul, Austrália, em 3 de janeiro. 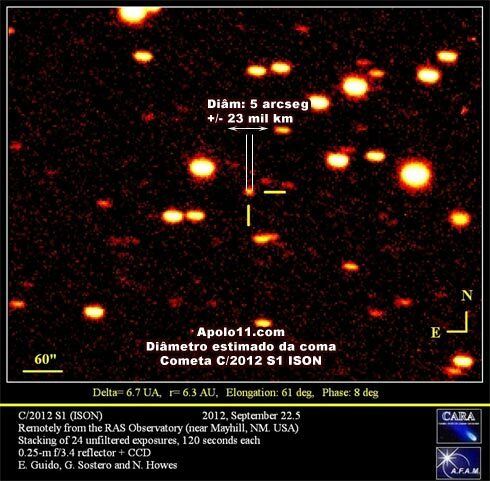 Quando a descoberta foi feita, astrônomos do Catalina Sky Survey, no Arizona, leram suas observações para encontrar imagens anteriores do cometa que datam de 8 de dezembro de 2012. Estas observações indicam a trajetória orbital do cometa C/2013 A1 direto para a Orbita de Marte órbita em 19 de outubro de 2014. Será que o planeta vermelho estaria em risco de um impacto potencialmente enorme no próximo ano? Estariam os veículos Curiosity e Opportunity em perigo de virar sucata? Parece que a probabilidade de um impacto no planeta é incrivelmente baixa – por enquanto. Segundo cálculos da NASA Jet Propulsion Laboratory (JPL), os dados de aproximação sugerem o cometa provavelmente passe perto de 0,0007 UA (que é aproximadamente 63.000 km da superfície de Marte). No entanto, há uma ressalva enorme. Devido às incertezas nas observações, pois o cometa só foi observado por 74 dias (até agora), fica difícil para os astrônomos calcularem com exatidão a previsão de localização do cometa dentro de 20 meses, o cometa C/2013 A1 pode voar baixo passado a uma distância muito segura de 0,008 UA (650.000 milhas). Mas para o outro extremo a sua passagem orbital de Marte poderia colocar o planeta diretamente em seu caminho. No momento da aproximação mais próxima ou de impacto de Marte, o cometa acelerará a uma velocidade vertiginosa de 35 quilômetros por segundo (126,000 milhas por hora). Além disso, nós ainda não sabemos quão grande cometa C/2013 A1 é, mas normalmente os cometas não são pequenos. Se ele atingisse, o impacto poderia ser um evento enorme, global. 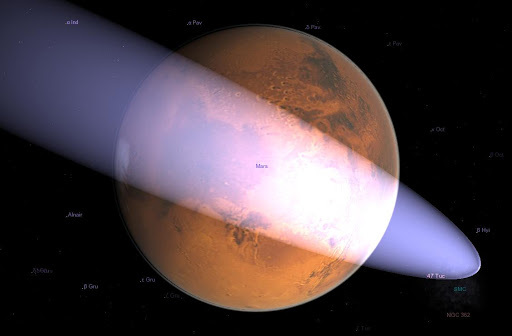 Mas a localização provável do cometa em 2014 também é altamente incerta, por isso não significa uma “coisa certa” para o impacto Marte (Curiosidade, você pode relaxar, por enquanto). This story was provided by Discovery News. As the comet C/2012 S1 ISON approaches Earth, speculation about its size, magnitude and potential start growing. Although many questions, what is known is that the comet may actually be the most brilliant of recent times. Or the biggest fiasco.ntil the next event that will become global issue that may be the number of comets that passed this year and someone’s sure to spread that there may be a collision. into oblivion leaving the 3 tragedies that even killing thousands of people, was of no use to those who would use their resources to protect life. Whenever a comet or asteroid is expected to approach the Sun, or rather the planet, speculation about its origin, size and risk of collision pop up in the media. So it was with Ikeya-Seki in 1965, Hale-Bopp in 1995, Kohoutek in 1975 or more recently with C/2006 P1 McNaught, Elenin in 2007 or in 2011. Recently, the discovery of comet C/2012 S1 ISON also gained much prominence in the virtual media, mainly because it is anticipated that the object really shine in late 2013, with some models pointing absurdly low values ​​of negative magnitudes near 18, which in practical terms means a true spotlight in the sky. (Just remember, the lower value of magnitude, the brighter the object). Comet C/2012 S1 ISON was first observed by CCD images recorded in observatories of Mount Lemmon and Panstarrs in the U.S. between December 28 2011 and January 28, 2012, but only had its orbit calculated from the remarks made by Russian astronomer Artyom Novichonok and his colleague Nevski Vitali, from Belarus, who used images taken by the robotic telescope of 400 mm belonging to the network ISON (International Scientific Optical Network), near the city of Kislovodsk, Russia. The orbit of C/2012 S1 ISON is kind of hyperbolic, so is not considered as part of the Solar System. Apparently, the comet originated in called the Oort cloud, a hypothetical region of space located trihões to 7.5 kilometers (50,000 AU – astronomical units), where supposedly comets and asteroids formed. According to some mathematical models, the Oort cloud could accommodate between one and a hundred billion comets, and its mass estimated at approximately five times that of Earth. The first calculations made after the discovery showed that the comet C/2012 S1 ISON reach perihelion (closest distance from the Sun) on November 28, 2013, when arrive at a distance of only 1.8 million miles from the center of the star, or 1.1 million km from its surface. 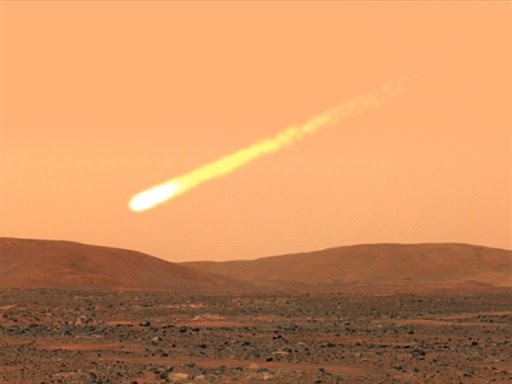 The calculations also showed that on October 1, 2013 the comet will pass just 10 million miles from the planet Mars on Dec. 26 and will reach its lowest point of approach to the Earth, 60 million miles away. Even without any chance of collision with the Earth, which draws the attention of this comet is undoubtedly its proximity to the Sun, scheduled for November 2013. Currently, C/2012 S1 ISON is only a dim light that can be seen only with large telescopes, but this situation will change as the sun begin to warm the comet nucleus and vaporize the ice that makes up most its structure, turning it into a big mane and a long tail blown by wind solar. 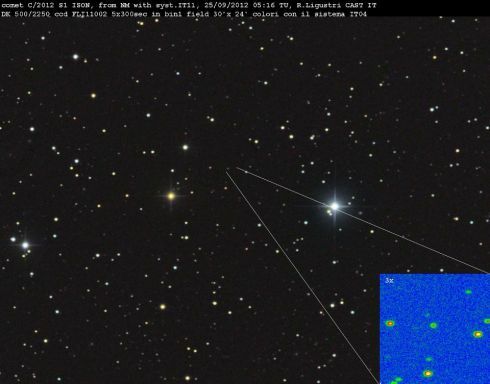 When was imaged by Remanazacco observatory, Italy, September 22, 2012, C/2012 S1 ISON was about 6547 AU, ie, 975 million miles from Earth. On occasion, the records showed that the coma of comet occupied about 5 arcseconds on sky, equivalent to 23,000 kilometers in diameter. However, with the approach and the consequent action of the Sun, this often eat to grow and become increasingly brighter. According to some models of magnitude, the brightness of C/2012 S1 ISON could reach up to 19 negative magnitudes. This is about 4000 times the brightness that the comet C/1965 S1 Ikeya-Seki in 1965 and then presented 40 times the brightness of the full Moon. However, in a projection made by Apolo11 using the SSD model (Solar System Dynamics), NASA, the smaller magnitude (brightest) achieved was -11.64 magnitudes, to be observed on December 29, 2013. Despite being a very big difference to other models, yet the brightness of C/2012 S1 ISON is almost three times that of Comet Ikeya-Seki or 25 times more intense than that of comet C/2006 P1 McNaught, who called much attention in 2007 and can be seen even during the day. To date, the brightest comet ever seen and had its magnitude was estimated C/1965 S1 Ikeya-Seki, which in 1965 was seen in daylight to shine with 10 negative magnitudes. 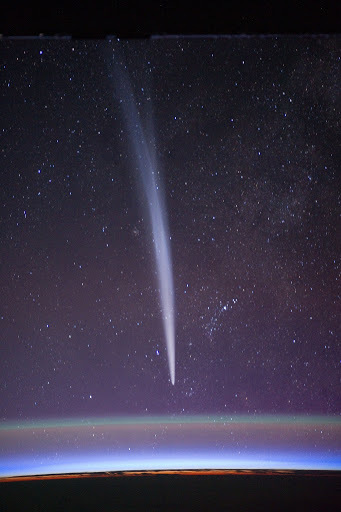 Then it was the turn of C/2006 P1 McNaught, the second brightest comet ever recorded. McNaught reached a magnitude of -5.5 and negative became a show in the sky around the world, including Brazil, where it can also be seen in daylight.